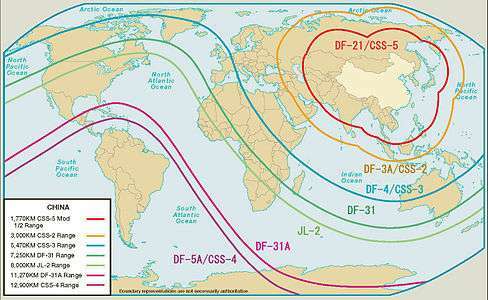 Range of various Chinese missiles (2007); DF-3A range in Orange. The DF-3A (NATO: CSS-2) is a Chinese Liquid-propellant rocket, single-stage, nuclear Intercontinental ballistic missile that entered service in 1971. In 1987 China sold several dozen (reportedly between 36 and 60) DF-3A missiles to Saudi Arabia Saudi Arabia publicly displayed them for the first time in 2014. Deployment of the missile began in 1971, reaching a peak of 110 by 1984, then shrinking to 50 in 1993. It was estimated by the U.S. DoD that there were 17 missiles and 10 launchers in operation as of 2010 under a single brigade. By May 2014, it appeared that the last unit operating the DF-3A completed conversion to the DF-21 missile from satellite photos of changes to the launch unit site. 1 2 "DF-3A / CSS-2". Federation of American Scientists. Retrieved 31 January 2014. 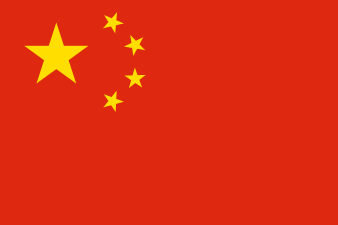 ↑ Military and Security Developments Involving the People's Republic of China 2013 (PDF). Office of the Secretary of Defense (Report). U.S. Department of Defense. 2013. p. 81. Retrieved 18 January 2014. 1 2 Chinese nuclear forces, 2010. Bulletin of Atomic Scientists. ↑ Mark Urban (6 November 2013). "Saudi nuclear weapons 'on order' from Pakistan". BBC. Retrieved 7 November 2013. ↑ "Saudi Arabia unveils part of strategic missile force - a deterrent move against Iran?". Defense Update. 2 May 2014. Retrieved 9 May 2014.